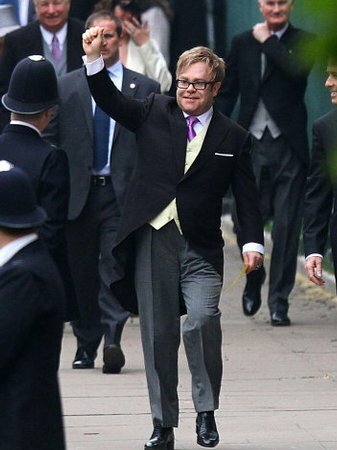 Elton John arrives at Westminster Abbey. David and Victoria Beckham arrive at Westminster Abbey. A police officers escorts guests arriving at the wedding of Prince William and Kate Middleton at Westminster Abbey in London today. Name places and programmes on seats in Westminster Abbey in London where Prince William and Kate Middleton will marry later today. Guests begin to arrive for the wedding of Prince William and Kate Middleton at Westminster Abbey. Children are pulled in a buggy draped in Union Flags on The Mall, London, on the day of the royal wedding. Members of the public in fancy dress by Horseguards Parade, central London, ahead of the Royal Wedding at Westminster Abbey, central London. Guests mingle in the Abbey. Guests mingle as they arrive at the Abbey. Rowan Atkinson arrived at the Abbey.